Bernard Knight Crowner John Omnibus: The "Sanctuary Seeker", "the Poisoned Chalice", "Crowner's Quest": "The Sanctuary Seeker","The Poisoned Chalice" and "Crowner's Quest"
Crowner John Omnibus: The "Sanctuary Seeker", "the Poisoned Chalice", "Crowner's Quest": "The Sanctuary Seeker","The Poisoned Chalice" and "Crowner's Quest"
Three gripping murder mysteries featuring Sir John de Wolfe, appointed by Richard the Lionheart as the first coroner for the county of Devon. 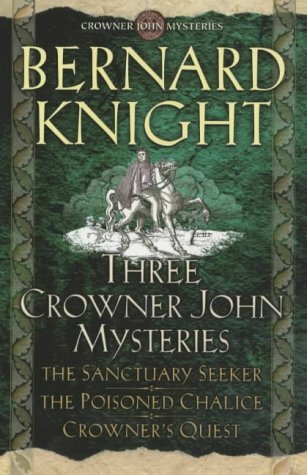 In THE SANCTUARY SEEKER, Sir John investigates the murder of a Crusader, a member of one of Devon's finest and most honourable families. In THE POISONED CHALICE, Sir John is embroiled in a case involving the well-born ladies of Exeter when the daughter of a rich merchant is raped. In CROWNER'S QUEST, Sir John is summoned to examine the body of a canon who has been found hanged. Suicide is suspected, but it is soon apparent that there is more to this case than meets the eye.